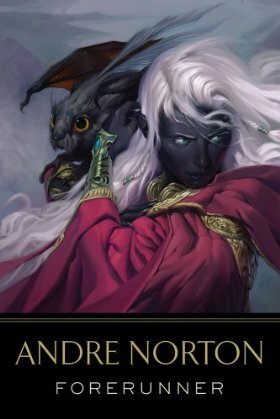 Andre Norton’s Forerunner, first published in 1981, is not her first book set in this universe, but it is the first of two books following the character Simsa. Although Forerunner was re-released a few years ago, Forerunner: The Second Venture was not, but both of Simsa’s stories can be found together in the omnibus The Forerunner Factor. The old city Kuxortal contained a variety of peoples, but Simsa never met another like herself. She does not know where she came from, and for as long as she can remember, she’s lived in the Burrows with Ferwar, an elderly woman who is not her kin. Those who live in the Burrows are the poorest in the city, making their homes out of the ruins of old buildings, and much of their earnings come from unearthing and selling the artifacts found there, particularly popular with visiting starmen. With her dark blue-black skin and light silver hair easily disguised with soot, Simsa is especially well suited to the task of blending into the night and finding relics for Ferwar. On one of these searches for treasure, Simsa finds instead a zorsal with a broken wing. She almost instinctively soothes the injured creature and immediately feels connected to her in a way she has not experienced before, never having been especially close to anyone, even Ferwar. Though she suspects there is a substantial reward for the zorsal, Simsa takes her home and cares for the wing to the best of her ability. The zorsal, whom she names Zass, can communicate basic concepts such as “danger” and “hunger” and becomes Simsa’s constant companion during her nocturnal excursions. Eventually Ferwar dies, and some of those in the Burrows see this as an opportunity to assume ownership of a better home—or even Simsa herself. When one man tries to assert his claim, Simsa successfully defeats him due to her high dexterity and sharp claws, but after that and an attempt on her zorsal’s life, she decides she’d better take action, fearing for them both. Simsa had no gods, and trusted in no one—save herself, and Zass—and perhaps somewhat Zass’s two offspring, who at least would answer her calls. But in herself first and most. If she were ever to achieve any rise above the Burrows, out of this constant state of having to be on guard, it would not be by the wave of any god’s hand, it would be by her own determined efforts. So Simsa sorts the artifacts Ferwar collected throughout the years and gathers those she plans to trade. Her timing is fortunate—a star ship lands and one of the starmen is quite obviously interested in purchasing some of her more valuable items. This man, Thom, is also interested in her expertise on these as he’s seeking his brother, who disappeared after coming to Kuxortal in pursuit of knowledge of these artifacts. Simsa is not certain if she can trust Thom despite Zass’ apparent approval, but when he’s in danger she chooses to aid him, leading to a difficult journey and the discovery of mysteries both ancient and recent—some of which may even be related to Simsa herself. Forerunner is an enjoyable story of adventure and discovery. I didn’t always find it a smooth read since the prose didn’t always flow well and I found myself rereading sections because of that, but I also tended to appreciate this style more after a second read. (Admittedly, this need to reread may have been at least in part due to Moving Brain—I have found it rather difficult to concentrate of late due to the upcoming move.) It’s more focused on the tale than depth of characterization, but I did find Simsa a compelling character and am glad that there is another story about her. One fantasy and science fiction trope I love is the intelligent animal companion, and it’s no surprise that this is my favorite feature of Forerunner, nor that the account of Simsa finding Zass in the first chapter immediately captured my attention. Simsa felt alone in the world and saw this reflected in this lone hurt creature, and in saving the injured zorsal she gained a lifelong friend. She learns the zorsal is surprisingly clever, able to evaluate whether or not someone else is trustworthy and smart enough to detect poisoned meat. Though Zass can not communicate in words, Simsa is able to understand her to an extent and Zass seems to respond to Simsa’s emotional state. The two forge a deep bond, and while Simsa has trained Zass to help look out for her, she looks out for the zorsal in turn, even sacrificing some of her own scant water supply for the zorsal when traveling through the desert. Simsa trusts Zass more than any person, which isn’t hard to fathom considering the difficulty of life in the Burrows: after all, she has to be ever vigilant against those who would steal her home or even Simsa herself. When she decides to aid Thom, the spaceman who purchases some of her merchandise, and ends up leaving Kuxortal with him, she struggles with this and expects him to betray or abandon her at every turn (even though Zass has judged him not to be a threat—Simsa wonders if his being from another planet may affect this assessment). At one point, she even tells Thom he trusts too easily and shouldn’t even trust her, and it’s interesting to read about the two of them together. Despite its short length, I didn’t find Forerunner a quick read, but I did find it entertaining and quite liked reading about Simsa (and Zass!). The ending is rather abrupt and it doesn’t supply many answers, but that didn’t bother me too much since Simsa’s last thought fit well with the struggles she faces throughout the course of the novel—plus it’s not like this is the end of Simsa’s story since it does continue in Forerunner: The Second Venture! This book is August’s selection from a poll on Patreon.